Water Dumples (ダンゴナマズ?, lit. : "Dumpling Catfish") are enemies in all of the main Pikmin games. They are members of the grub-dog family, and act like Dwarf Bulborbs. They are most commonly found in the water, but can survive on land as well. They resemble blue cat- or shellfish, with relatively large mouths, whisker-like features, and tentacles at the rear of their abdomen. They are weaker and slower with each successive game, but can always be defeated easily if the player is cautious and swarms them. Just like Bulborbs, Purple Pikmin in Pikmin 2 will work particularly well if this creature is found on land. A Water Dumple can be defeated easily by leaders as it has few hit points. "The swimming version of a Dwarf Bulborb has a large mouth and a big appetite. Since Water Dumples are blue, they blend in with the water. Squash them with blue Pikmin or draw them out of the water and hit them with purples. Beware they can spot you from a greater distance than other enemies can." "Water Dumples are compact aquatic creatures capable of quickly devouring a small group of Pikmin. Given their size, these enemies are surprisingly powerful, so it's best to overwhelm them before they have a chance to attack. When you encounter a Water Dumple, flank the creature and send a squad of Blue Pikmin charging in from the rear." In Pikmin, Water Dumples are found in or near bodies of water and always in groups. They have one simple bite attack that can grab only a few Pikmin at a time, and if attacked, they may shake any Pikmin off of their bodies. Though similar in stature to Dwarf Bulborbs, Water Dumples cannot be defeated by one Pikmin thrown directly onto their back, but can be defeated rather quickly, regardless. If a Water Dumple spots a Pikmin or leader, it will give chase and continue for a considerable distance. Water Dumples are very much unchanged in Pikmin 2. They are more fragile (but still sturdier than all varients of Dwarf Bulborbs), and they are found more frequently on land due to the many caves they appear in that contain little or no water. Water Dumples are similar to their previous appearances in Pikmin 3, but they have gone through a few notable changes. They are found alone or much more spread out in several areas, but still found in water in almost all cases. Since they are frequently single targets, they are also slightly stockier. Most notably, Water Dumples can now counter Pikmin very easily if attacked from the front; with its simple bit, one creature can shake a huge army off its face before taking much damage at all, leaving the attackers vulnerable. Swarming a Water Dumple with a large army of Pikmin is usually very effective. If these enemies are in large groups, however, and you have few Pikmin, it is likely that some Pikmin will be eaten, as the Dumples attack with quick lunges. In such a case, separate the creatures by luring them away from the group one after another. If you lure a Water Dumple too far out, it will lose interest and begin to return to the group or its original location. When this happens, swarm them from behind to ensure a quick and safe victory. The basic strategy for defeating Water Dumples is unchanged; swarm with a large group of Pikmin. However, a few new strategies are brought to the table. 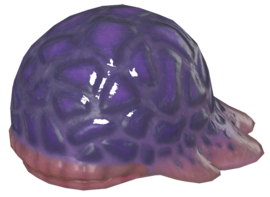 If you have Purple Pikmin at your disposal, use them to stun the creature from a distance, and then continue pelting it for a quick defeat. This way is safest, as the creature should not be able to regain its sense fast enough to fight back against the Pikmin. Also, now with stronger punches, it is possible to take out Water Dumples effectively with a leader. This may take a while, but if it is your best option for some reason, just circle the creature, punching it and backing off when it shakes or bites. One new precaution must be taken with Water Dumples: don't send your squad in from the front. Doing so will result in the Dumple shaking off all Pikmin, no matter how many, and following up with bites. It is best to approach it from the rear and charge from there, or just throw Pikmin onto its back and whistle them back off if/when it attempts to shake them off. In the name "Water Dumple", the word "water" is naturally related to its tendency to be submerged, while "dumple" is the word "dumpling" without the -ling suffix. "Dumple" is not a word that exists in the English language, but it derives from dumpling because of the creature's Japanese name: ダンゴナマズ?, which translates to "Dumpling Catfish". It could be said that the creature's simple round shape is what inspired the word "dango" for the Japanese name. The "catfish" part is because the real world catfish, in that the Water Dumple has fish characteristics, mostly in terms of being underwater, and cat-like whiskers. Its scientific name is Ichthyosa felinis, which means "cat fish"; "ichthys" is Greek for "fish", and "felinae" is the subfamily of cats, where "felinis" comes from. Internally, it is known as namazu in Pikmin and Pikmin 3, which is part of its Japanese name, but in Pikmin 2, this word is translated, making it catfish. French Bouledeau Portmanteau of "Boule" (ball) and "eau" (water). Also a pun on "bulldog". Doong geul mae gi '둥글' means Round, '메기' means Catfish. The creature dead in Pikmin 3. Concept art of a Water Dumple. Two Water Dumples in the enemy reel. Another artwork of a Water Dumple. A Water Dumple in the Piklopedia. Note the absence of whiskers. The corpse of a Water Dumple. The creature's e-card, #11 (8th blue card). The front of a Water Dumple shown from the KopPad. A closer look of the Water Dumple. It is stated in Louie's notes on the Bumbling Snitchbug that Water Dumples lay eggs. Their "whiskers" are only present in Pikmin, having been removed in Pikmin 2 and Pikmin 3 for unknown reasons. In Olimar's notes for the Wogpole, it is said that Water Dumples feed on the creature's eggs. The Water Dumple's design is likely made up of 2 separate species, the catfish and the shingle sea urchin. This page was last edited on April 4, 2019, at 16:04.